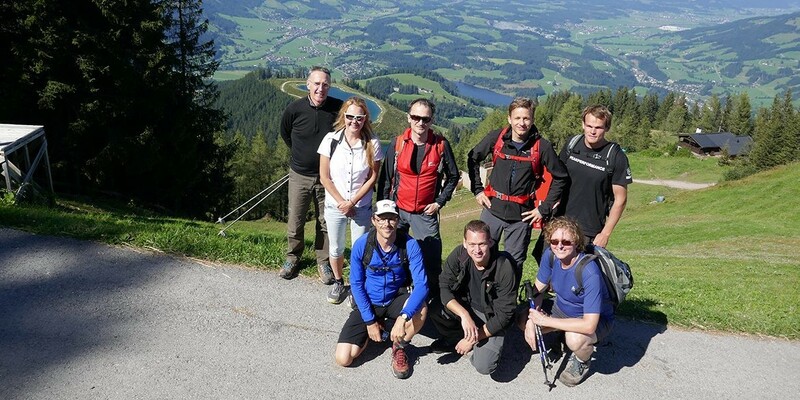 A team of delegates from ZAMG – Central Institute fir Meteorology and Geodynamics – journeyed to Kitzbühel on 7th September. "The objective was to acquaint ourselves with the local conditions of the racecourses", said Manfred Bauer, head of ZAMG in Innsbruck. For years, ZAMG in Innsbruck have advised the Hahnenkamm Organising Committee on weather issues. Technical staff were usually on site, but the meteorologists stayed in Innsbruck. The reason being that all the computers are installed in Innsbruck, as well as the associated equipment for creating weather forecasts. During the Hahnenkamm period, three additional weather stations will be installed in addition to the permanent "TAWES" station, in order to compile precise forecasts. ZAMG experts were able to acquaint themselves with the situation on site, where discussions were held together with technicians on the optimisation of the temporary weather stations. Michael Huber: "It is important for the contact person to be aware of the prevailing conditions when advising on the weather ". After all, good weather forecasts have utmost priority for the HKR. Ski racing is of course an outdoor sport and subject to weather conditions. Jury decisions, especially those made by FIS Chief Race Director Markus Waldner and HKR Race Director Axel Naglich depend both indirectly and directly on the weather prognosis. Manfred Bauer, head of ZAMG Innsbruck, thanked Huber: "Today’s inspection of the Streif was important and means we can deal better with the constellations along the Streif and Ganslern racecourses".